Muslims around the country are celebrating Eid today as they mark the end of Islam’s holy month of Ramadan. Fasting during the holy month of Ramadan is one of the five pillars of Islam and believers abstain from eating and drinking during daylight hours. 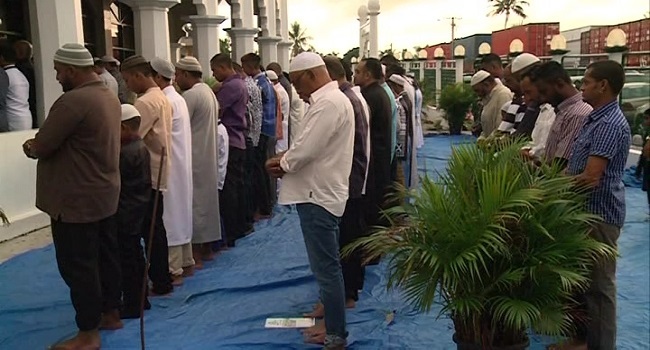 Fiji Muslim League President Hafiz Khan says the festival of Eid brings a message of peace. Attorney General Aiyaz Sayed-Khaiyum says Eid is a time for reflection. “Of course we would like to wish everybody a Happy Eid, Eid Mubarak as they say. The month of Ramadan is of course a time for reflection in particular for personal reflection so you know some people for example they may have a bad temper so in the month of Ramadan hopefully with less eating and less drinking they are able to have more sort of physical self-reflection but at the same time the deeper sort of message is the spiritual self-reflection." Sweets and traditional desserts are also distributed and served among friends, family and to the needy as a gesture of sharing and partaking happiness and good luck.